What Are the Symptoms of a Bruised Tailbone? 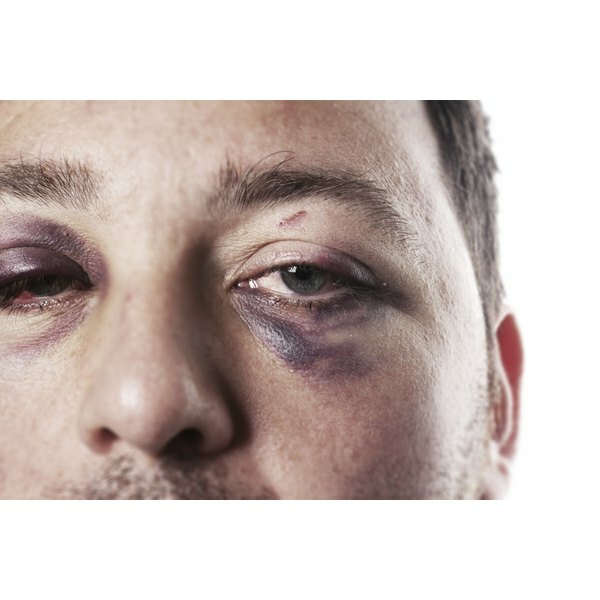 A fractured eye socket occurs when the small bones surrounding one or both eyes becomes damaged due to facial trauma. This type of fracture--which is also referred to as an orbital or blowout fracture--can cause severe eye damage in certain patients. If a person develops symptoms of a fractured eye socket, they should seek immediate medical care to prevent further complication. Severe damage to the bone and skin that surround the eye can cause excess fluid and blood to accumulate at the site of trauma, explains the Merck Manual, an online medical encyclopedia for health and medical professionals. Fluid accumulation can cause the eyelid of the affected eye to appear swollen or enlarged. Swelling of the eye can also interfere with the ability to open and close eyes normally, which can lead to vision problems. Trauma causes blood to pool at the surface of the skin, leading to skin discoloration called bruising. Patients will notice that the skin around the injured eye appears unusually yellow, red, blue or purple in color. Skin discoloration symptoms of a fractured eye socket are temporary and typically diminish as the wound begins to heal. Patients can also experience mild to severe pain within or around the injured eye, warns the Merck Manual. Such symptoms can persist until the fractured eye socket fully heals. Excess fluid buildup around the injured eye can limit the ability to move the eye normally, explain medical professional at the University of Virginia Health System in Charlottesville. This symptom of a fractured eye socket is generally temporary but can significantly interfere with a patient's ability to see normally. The uninjured eye typically retains normal function and can move about as usual. Eye trauma that results in a fractured eye socket can lead to vision alterations in certain patients. Blood or fluid within the damaged eye can cause patients to experience blurred, double or cloudy vision, report medical professionals at Children's Hospital Boston in Massachusetts. Excessive swelling around the eye may prevent them from opening the injured eye until the swelling subsides. Vision alterations associated with a fractured eye socket can persist until the bone completely heals. In certain instances, vision loss can become permanent if the nerves within the eye sustain severe damage following trauma. Patients should speak with an ophthalmologist (eye doctor) for further evaluation and treatment if they experience an eye socket fracture. What Causes Double Vision in One Eye? What Causes a Kaleidescope Halo in the Eye?